(Newser) – The US Fish and Wildlife Service plans to save endangered ferrets with a "glorified gumball machine" that shoots M&Ms. Beginning in September, government scientists say they'll use a drone armed with a device that shoots candies in three directions in an effort to stop a plague in northeastern Montana. The M&Ms, containing vaccine-laced peanut butter, will be aimed at prairie dogs, which have been hit hard by the sylvatic plague carried by fleas. As the plague also affects the 300 endangered black-footed ferrets known to exist in the wild—which prey on prairie dogs and steal their burrows, per the FWS—scientists fear it could spell disaster for both species, per the Guardian. The picture gives the impression "WTF you looking at." Oh wow. My mom's boyfriend once spent a year in the hills watching for blackfooted ferrets as part of a project to see if construction could go forward on a building. They had to make sure they didn't damage any ferret habits. Two men, in the desert for a year with binoculars and they never saw a single one... Twenty five years later we have drones to keep up with them. Nice. 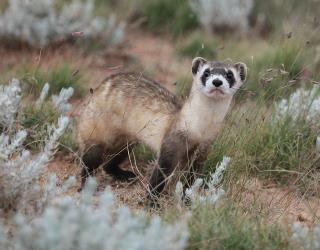 Black footed ferrets and prairie dogs -- adorable. Glad they're working on this plague problem, but it would be nice if they could help with the fleas, too. Can't imagine how these animals must suffer from those infestations.